I went to hear Barack Obama speak at the University of Denver this morning and I have to say after hearing him rally the Denver community around his campaign to become the next president of the United States..I believe that he can do it. I think that for anyone who has yet to hear him speak, you need to do it now! 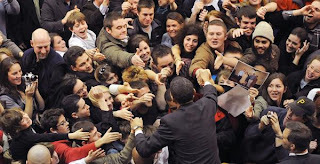 You may have heard that everyone in the Democratic party is supporting the same issues with slightly different methods, but Barack may be the only one that can get you to listen to him without cringing, then believe him, and THEN actually want to become a better person for your neighbors, yourself, and yes, even your country. Plus, a cute little appearance by the nervous Denver Bronco Rod Smith and a heart-warming introductory speech by the lovely Caroline Kennedy, this was a really moving and motivating community event. So, SO glad that my office crew and I skipped work together to go even if 20,000 people showed up for 9,000 seats! Please check out the link on the Denver Post today just minutes after the rally.